Our highly skilled and trained technicians rely on quality and precision to deliver you with exceptional service that keeps you safe. We assure you that our FAA certified technicians complete thorough training before any maintenance. Helicopters are your mission, and it is critical to ensure you have first-class maintenance services. We provide maintenance, repair, and overhaul when you require them. We can provide avionics support and services, as well as avionics upgrades as required. Our goal is to keep your downtime to a minimum, delivering quality maintenance services with fast turn-around times. You rely on your helicopters for transport. Our diverse clientele and experience providing service at our FAA repair station leaves you with complete satisfaction. Our FAA authorized technicians provide upgrades, new installations, retrofits, modifications, and more. Our team provides support for the private and commercial sector, delivering world class service that is cost-effective and time sensitive to your needs and requirements. With our inventory of over the counter parts, we have Agusta, Airbus, Sikorsky, MD, and Bell helicopter parts available at competitive prices to keep your helicopter in service. 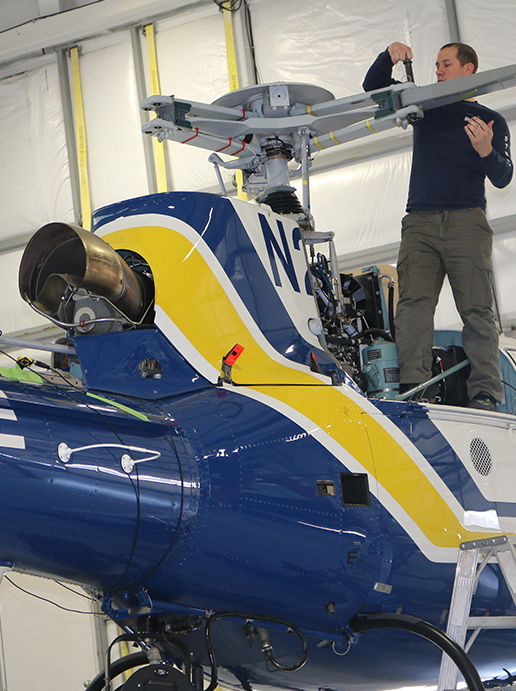 Sterling Helicopter is an FAA certified repair station that provides maintenance and inspections, including major avionics upgrades, engine repairs, modifications to airframes, and other maintenance services. Our repair station works on many aircraft from around the world, offering custom services and helicopter component overhaul to exceed your expectations. If you have any questions regarding our services, please contact us. We consistently deliver quality services, completing each project with integrity and accountability.